Prix : Has achieved a fuel economy of 1584 miles per gallon for a total score of 1799. 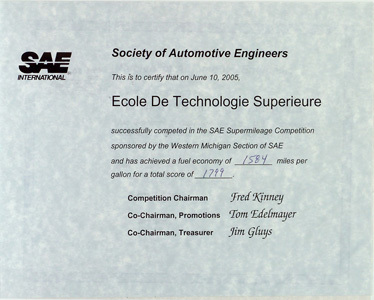 Notes : This is to certify that on June 10, 2005, École de technologie supérieure successfully competed in the SAE Supermileage Competition sponsored by the Western Michigan Section of SAE and has achieved a fuel economy of 1584 miles per gallon for a total score of 1799. Competition Chairman Fred Kinney. Co-Chairman, Promotions Tom Edelmayer. Co-Chairman, Treasurer Jim Gluys.